It’s commonly said around the south side that Comiskey Park (either the old one or the new one, depending on who you ask) was built over an old cemetery, and that the bodies are still there. Sometimes it’s specifically specified that it’s the bodies of Civil War soldiers. I’ve been on the trail of this one for a while, and coming up blank. Maps of the area from a decade or two before first Comiskey was built show a blank space where the old park was, and a bunch of smaller buildings where the new one is (plus some more blank space – see clip from the map on the right). Lakeside Directories from the 1870s and 1880s that list all of the cemeteries in town don’t say anything about a cemetery anywhere near there. But such directories aren’t necessarily comprehensive lists of burial grounds; they leave out some major ones (such as the Potter’s Field at Dunning) and all of the smaller family plots. There are literally dozens of “lost” cemeteries in the city, so it’s not impossible that some bodies were in that spot at one point. 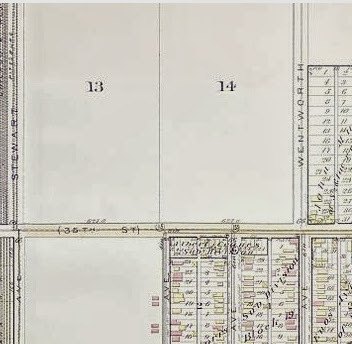 However, the story almost certainly grew out of the park’s proximity to the site of Camp Douglas, the Civil War prison camp, which was a straight shot down 35th street (then known as Douglas Street, in fact). Roughly 6000 confederate prisoners of war died there, and it’s actually close enough that people surely used the former grounds as parking for Sox games at various times. How many bodies were buried on the prison grounds, though, is sort of unknown – most of the bodies were turned over to CH Jordan to be buried at City Cemetery (about where the baseball fields in Lincoln Park are now), though it was widely believed that in many cases, the staff at CH Jordan often just pocketed the $4.75 they got per burial and either sold the body to a medical school (saving the grave robbers some digging) or simply dumped them in the Lake. (CH Jordan is a topic for a whole other post). There was a small cemetery someplace on or near the prison grounds that was used to bury prisoners who died of cholera. How many of those bodies were eventually moved is probably anyone’s guess. So, as near as I can tell, there are no bodies underneath Comiskey, or the new US Cellular Field, but I’d love it if anyone can chime in with more data here!